Strict warning: Only variables should be passed by reference in eval() (line 48 of /var/www/vhosts/oasisdivers.com/modules/php/php.module(80) : eval()'d code). Strict warning: Only variables should be passed by reference in eval() (line 89 of /var/www/vhosts/oasisdivers.com/modules/php/php.module(80) : eval()'d code). Strict warning: Only variables should be passed by reference in eval() (line 126 of /var/www/vhosts/oasisdivers.com/modules/php/php.module(80) : eval()'d code). 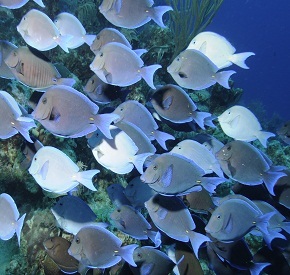 Turks and Caicos diving – an unforgettable adventure. The turquoise blue water turns a deep dark blue just a few hundred yards from shore where our world-renowned wall drops 7000’ into the abyss. Oasis Divers prides ourselves on providing you with an experience you won’t soon forget. With top-of-the-line equipment, knowledgeable staff, personalized service, and an impressive safety record, we are the perfect partner as you discover one of the top scuba diving locations in the Caribbean. However you want to add excitement to your vacation, Oasis has the answer. Kayaking, fishing, snorkeling, and much more! Discover our tucked away tropical paradise, located in the heart of the Caribbean. Get the best of the both worlds, great accommodations and world-class diving in one convenient package. It’s that time of the year again – whale watching season is here! Each winter, the majestic humpback whale makes Grand Turk its home.